Ierapetra, Europe's southernmost city, sits on Crete's southwestern coastline and draws attention with its mild weather and award-winning beaches. Facing the African coast, the town counts among the world's sunniest holiday resorts, offering a growing number of foreign travelers a blend of rich history and modern tourist attractions. The seafront area remains the town's busiest district, packed with taverns, restaurants, and shops. 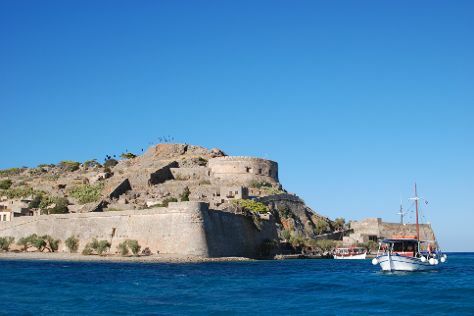 Away from the shore you can explore the relics of the island's Venetian past, including a 13th-century fortress built to protect Ierapetra's harbor. Ierapetra is in Lasithi Prefecture. Arrange all the small, but important details of your Ierapetra trip itinerary using our Greece attractions planner . Access the majestic Libyan Sea by staying at one of the many waterfront hotels in Ierapetra, the largest town in south Crete. Visitors have their pick from a number of larger, family-friendly hotels and rental apartments here. Along with these fine choices, young travelers looking to enjoy the local nightlife can also find more affordable lodgings. To stay at a luxurious villa, spa, or hotel, head east of Ierapetra to Koutsounari's beaches, which are also home to campgrounds with good amenities.